Marcus is back with a really beautiful edit of the “Kassel Ost Bowlmasters 2012”. This events is vert tricks only as you can guess from the name 🙂 A lot of nice pool and vert tricks going down in this video. Want to see some footage of a nice event. This is probably a really good choice. Go check it out in full screen and enjoy !!! Marcus release his 2000 subs special today. He hits you with a montage feat. Taylor Rosenbauer. You think that alone is amazing? Check out the video and get impressed. A lot of crazy nice tricks that both guys doing. Definitely worth a fullscreen !!! Go sub Marcus if you not already have. We want to see his 3000sub special soon !!! Kylie puts out her first outdoor video his year. Like always she is showing off here amazing skills. Mixed with the outdoor feeling and music you can’t really go wrong with this video. If you haven´t subscribe her check out here channel here. This time we doing it a little different. We want to give out a set of badges and a deck. Our goal is to reach 600 likes. When we reach the goal we will announce the winner. Share this with your friends on Facebook. 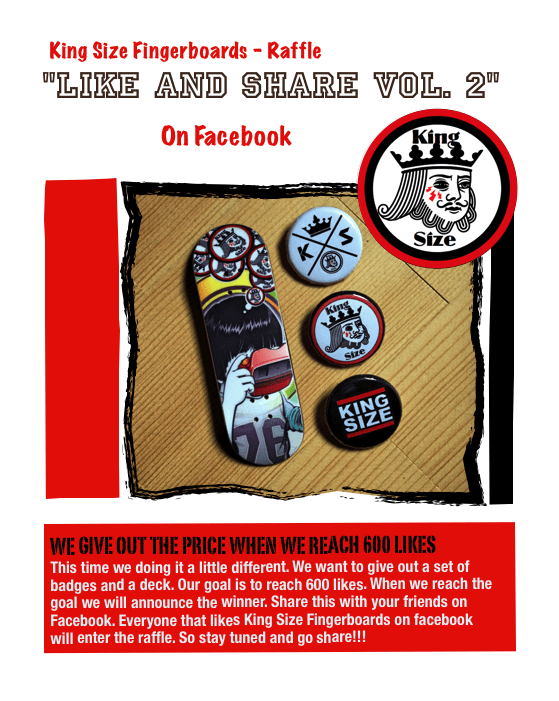 Everyone that likes King Size Fingerboards on facebook will enter the raffle. So stay tuned and go share!!! Kylie released yesterday here new Fingerboard Video “KOPEIKA”. I feel like its on of here best videos yet. A lot of different spots paired with here amazing style always nice to watch. This video is simply sick. Lay back / fullscreen / enjoy !! !